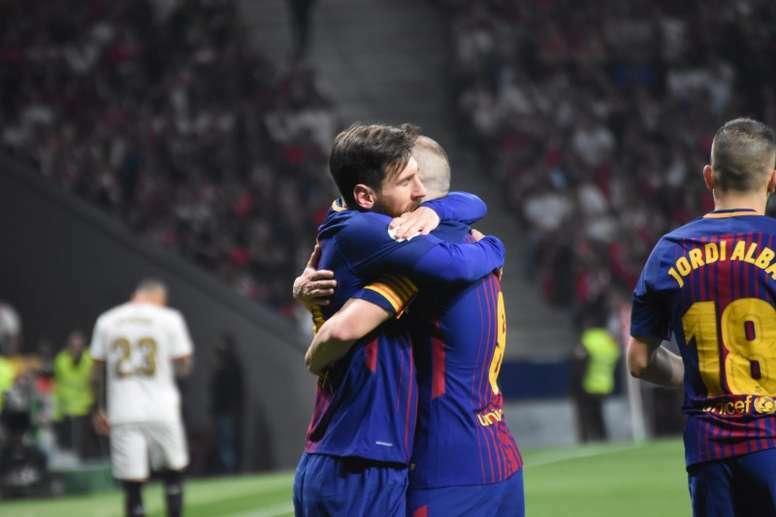 One of the emotional pictures that eclipsed Saturday night’s Copa del Rey final was of the warm hug between Lionel Messi and Andres Iniesta following the influential playmaker’s goal. Between Leo and Iniesta, they have won everything there is to win in football as the ideal time for one of them to bow out draws near. Football players are often reprimanded by fans for not celebrating goals adequately, but rather as Messi and Iniesta wrapped in a warm hug on Saturday night there was something more than exceptional about the goal celebration. With Messi’s eyes shut and every player passionately clinging to the next, it was so surreal this was about something other than just Iniesta goal. From various perspectives, the emotional image transcends football, the enthusiast, passion, and friendship between the duo with a profound regard for each other, one of whom realizing that was an actual farewell. Iniesta and Messi have turned out to be synonymous with Barcelona throughout the years, to the point that they have won 62 trophies with the club between them, 31 each, a figure which will rise to 63 when the Catalan giants hoist their impending Laliga title. Saturday’s triumph over Sevilla implies they have both now won six Copa del Rey title, something unmatched by any other player for the club. To lovers of the beautiful game, Iniesta is a player that characterized a generation. His balance, exactness, precision and perfect passing are relatively expected of a playmaker nowadays after the influential midfielder from La Masia spent so much time making everything look so natural, while he additionally had an innate ability to beat two or three players with his tactfulness and body balance. Unfortunately, it appears his time at the Camp Nou is closing up, with speculations developing ever stronger that he will make the move to the Chinese Super League within the near future. On the off chance that, that proves to be the situation then he couldn’t have asked for a better approach to bow out than a comfortable Copa del Rey victory over Los Rojiblancos, marked with a superb goal. With Iniesta due to make a decision on his future this week, Messi and Iniesta relationship is coming to an end. As delightful as it has been watching every one of them separately, their combination play has taken the breath away more often than not over the past decade. Messi and Iniesta do and always have dovetailed perfectly and while Neymar may also have leave Messi recently, it’s a well-known fact that Iniesta vacuum will be significantly more difficult to replace.